On January 10, US president Donald Trump announced the delivery of a number of fighter jets to Norway, as part of an effort to boost a defensive relationship in Northern Europe. 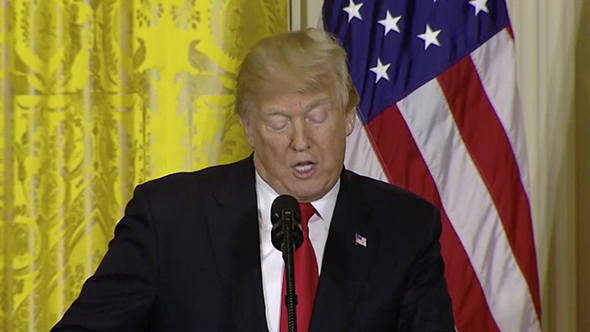 “In November we started delivering the first F-52s and F-35 fighter jets,” said Trump. But F-52s don’t exist – at least not outside of Call of Duty. Here for the military tech? Check out the best tank games on PC. The F-52 is a fictional plane that seems to only exist as part of Call of Duty: Advanced Warfare, which players fly into the Middle East as part of the campaign’s Throttle mission. You can see some footage of the digital plane in action above. The Washington Post says the White House has not responded to a request for comment on the issue, nor to a question about Trump being a Call of Duty fan. More likely, the president misread prepared remarks, as the next line was “We have a total of 52 and they’ve delivered a number of them already a little ahead of schedule.” Either that, or he’s a big fan of the band behind the 1989 hit Love Shack – or the B-52 bombers for which they’re named.